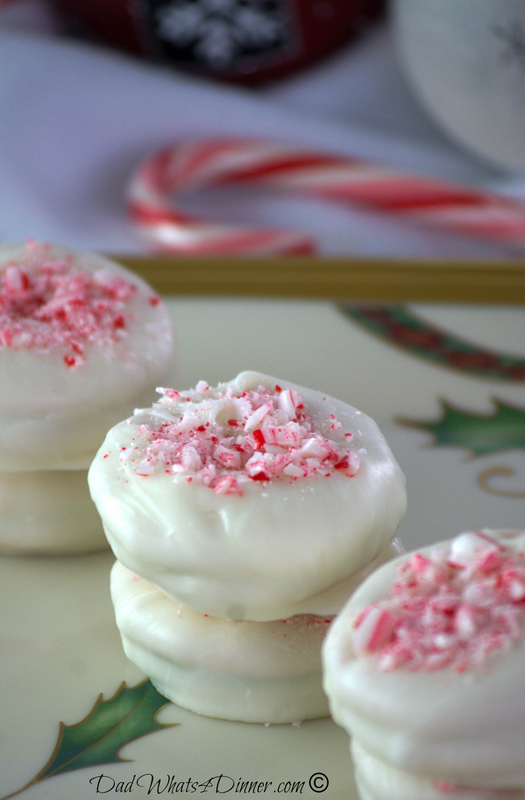 Peppermint Ritz Kisses are the perfect 4 ingredients, 30-minute cookie for the Holidays! Okay, so I am a little embarrassed to call this a recipe. It’s more like a tutorial on how to make a very yummy, simple, kid-friendly, Christmas treat. What’s wrong with that? Nothing!!! So I came up with these Peppermint Ritz Kisses while I was having cheese and crackers. You ask how did I go from cheese and crackers to a wonderful simple treat. Well, I was eating cheese on a reduced-fat Ritz cracker. Sad to say but it wasn’t tasting very good. Don’t get me wrong I love Ritz but sometimes the reduced-fat version as well, not as buttery as the real thing. I buy the reduced fat version for obvious reasons. I probably shouldn’t eat cheese and crackers anyway, but it is one of my favorite snacks. 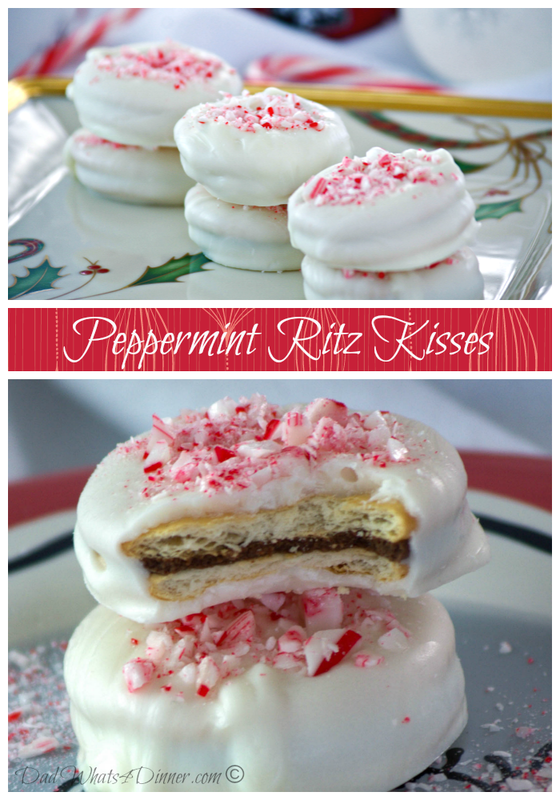 So back to the Peppermint Ritz Kisses. As I was not enjoying my reduced-fat Ritz I decided I could make a sweet treat out of the rest of the box. I wanted to call these treats low-fat but my wife quickly told me NO. Either way, they are awesome and less fattening than using regular Ritz, so there!! 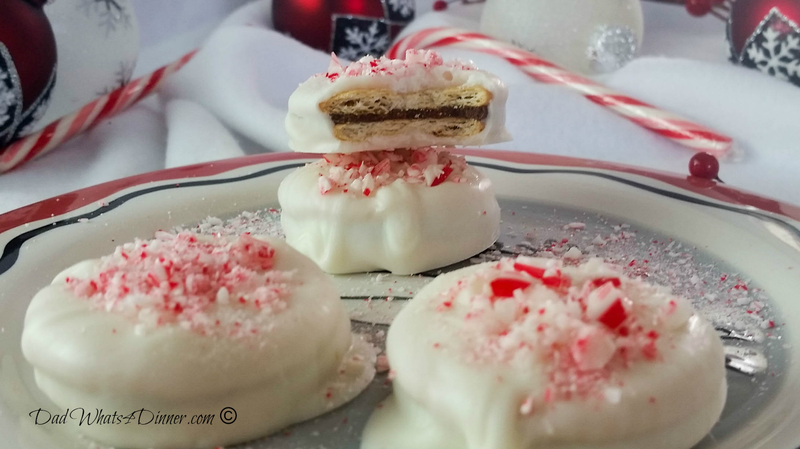 There are hundreds of “recipes” on Pinterest and the web for desserts made with Ritz crackers. It is amazing some of the dishes made with a simple cracker, but the sweet and salty mix really works. Since I had an almost full box of crackers left, I decided to make these treats while I was baking and cooking for Christmas all weekend. 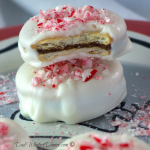 My Peppermint Ritz Kisses was by far the simplest cookie I made and they look so good. The flavors of salty crackers, semi-sweet kisses, sweet white almond bark and crushed peppermint just work great together. Get a box of Ritz crackers, a bag of Hershey Kisses, a container of white melting bark, about 4 candy canes and a microwave and you are all set. Quick simple and Oh so good. A perfect treat for a kids Christmas party but nice enough to take to your office holiday get together. 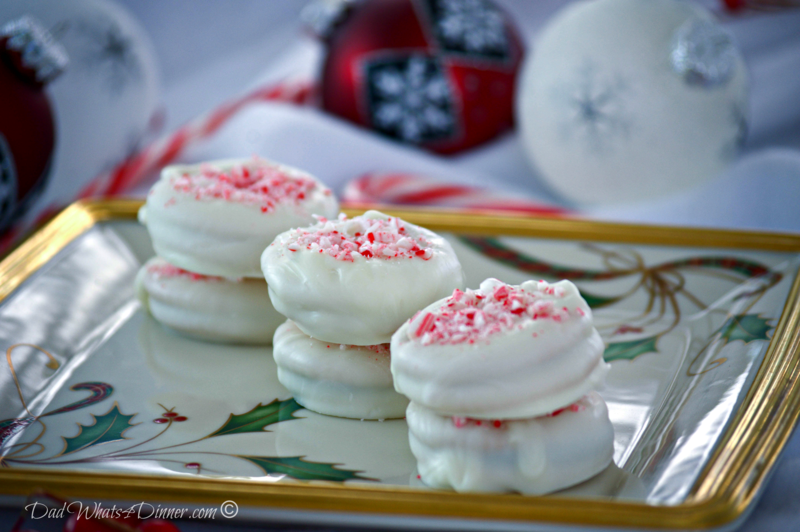 Peppermint Ritz Kisses are the perfect 4 ingredient, 30 minute cookie for the Holidays! Place a single layer of crackers on a microwave safe plate. Melt on high for about 1 minute, checking often. When chocolate starts to melt remove plate from microwave and top with another cracker. Push down lightly being careful not to crush cracker. Microwave for a few more seconds if needed. Melt white almond bark according to package directions. Using tongs dip cracker sandwich into melted chocolate and place on parchment lined pan. Sprinkle with candy canes. Allow to cool completely before serving, if you can!! I also made these with miniature Reese's cups. They tasted great but do not top with crushed candy cane. They are so pretty – love the contrast of the candy cane against the white! Sorry I am just now responding. Your message was kicked into the spam folder. Yeah i thought the pic turned out great. Have a great week. Sorry Linda your message was kicked into the spam folder. I love that you used chocolate kisses. That would be more chocolate in the center for me! Love this recipe. Easy and pretty. Pinned! Hey your back… :)) Did you mean you need more chocolate or a kiss is to much?? Nope a kiss is just riiiiggghhhtttt! 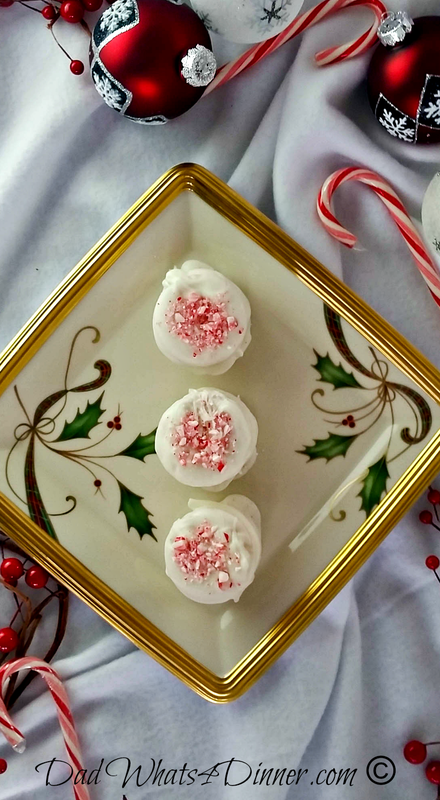 What a super easy and gorgeous holiday treat! I love this idea! Thanks Marie. It is amazingly easy and you cannot tell it uses Ritz crackers. Thanks for stopping by. These are very pretty. My kids would totally devour them. I wouldn’t have thought to use crackers. My family loves Ritz. Great tutorial! Thanks, Glad you didn’t call it a recipe. :))) Yeah they do not taste like crackers at all. Have a great weekend. Love the idea and I do like the low-fat Ritz crackers. But once you cover it with chocolate who cares? I cover Oreo cookies in different molds with chocolate and they are not low-fat! Thanks. The Oreo’s sound yummy. Have a great weekend. These look dangerously delicious! I recently bought a box of Ritz crackers for a recipe, but it only used one of four sleeves. I guess I know how I’ll be using up the rest! Now you have the perfect excuse to use up those crackers. Thanks for stopping by and let me know how they turn out. I have to say that simple cheese and crackers are a favourite of mine, as well and I probably have them way too often. These cookies are so cute and I love how easy they are to make. I would never have thought to melt chocolate onto a Ritz, but I’ll definitely be trying it now. Thanks for sharing it at Fiesta Friday. Have a great weekend! Stopping by from Snickerdoodle Sunday Quinn to check out your Peppermint Ritz Kisses, because they turned out so pretty and Christmas-y! Thanks for sharing and hope you’re enjoying your Saturday! Hi Sarah, Thanks for stopping by. They taste pretty good too! Have a great week. Wow, looks yummy and festive! Love how quick it is! Thanks for sharing at Funtastic Friday! Oh Quinn these look so tasty, sometimes simple is the best right?!?! 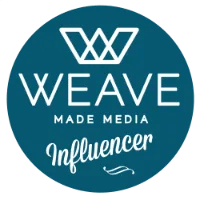 Pinned and thanks for sharing! Thanks Katie. I was surprised how easy they were to make and Oh so good. Seriously amazing and awesome that they are pretty easy to make. Microwave?!?!? i’m totally in! Thanks for sharing with Saucy Saturdays! Yeah they are super easy and oh so good. Glad to share..
Hey Quinn! I love this recipe! You are my feature at this weeks Funtastic Friday Link Party. Thank you for linking up!